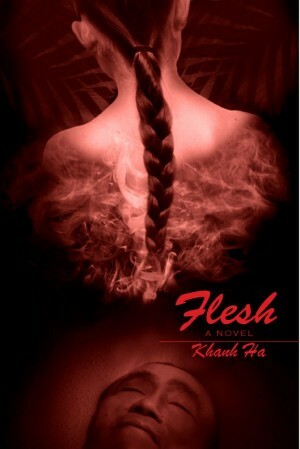 Flesh opens daringly with a beheading. It is Hanoi, 1896, and a young boy watches as his father, a bandit, is executed. But we soon move onto the dark ugliness of the city of Hanoi, where young Tai is to work for a geomancer in exchange for a ‘lucky’ burial plot for his father, and where he meets Xiaoli, a Chinese girl who works in an opium den. I’m not sure that I’ve read anything else that has told me what opium smelled like before! While the descriptions of 20th century Tonkin are lush and fulfilling, I wished that a finer-toothed comb could have weeded out some of the less than efficient conversations, and teased out the plot a little better. As a result, my reading of this book was very meandering – pick it up, put it down, panic that the tour stop is coming up. Didn’t help that Song of Achilles was distracting me at the same time. Next Post → Eep! Iep! Thank you, olduvai, for a gracious review. I am glad that you liked the mood and the ambiance in FLESH and hope that readers would also find in it, besides all the sensuous descriptions, a valuable read on history lesson and moral obligations of kinship that brings together the broken lives of the demimonde, and the bruised, fallen lives of some others. (Among them the boy, psychologically damaged by his family tragedy, who no sooner gets his life together than falls in love with a mysterious girl and finds his life in peril.) What you captured from the book means much to me that others might get a chance to experience it themselves. Thanks Khanh Ha for dropping by and leaving a comment! I look forward to hearing about your next book. I don’t think I’ve ever read a description of the smell of opium … sounds like this author excels at conveying a sense of place that includes smells and tastes! Thanks for leaving a comment, Heather! He must have done quite a fair bit of research in order to describe such a different time. I know exactly what you mean, when you say the brown, the brown, the brown. That definitely pervades the novel. And, yet, I never really thought of it as ‘brown’ because he uses so many different words and images to describe it. He fooled me (in a good way)!